The goal of our 12-person Canadian study, designed similarly to the Swiss study completed by MAPS, was to learn if we could replicate the outstanding results of MAPS' U.S. study. This was the first clinical psychedelic study in Canada since the mid-1970s. Ingrid Pacey, MBBS, FRCP(C), a psychiatrist and certified Grof Holotropic Breathwork practitioner, was the Principal Investigator conducting this study. Dr. Pacey is an experienced therapist who worked with MDMA-assisted psychotherapy prior to its criminalization and shares a theoretical orientation with our U.S. and Swiss teams. This study had full approval from an Institutional Review Board (IRB), Health Canada, and the U.S. FDA. Data was also submitted under MAPS' U.S. IND #63,384. An amended protocol was approved by the Institutional Review Board on July 12, 2013, and by Health Canada on September 6, 2013. This study has completed all treatments. Dr. Ingrid Pacey comes from a Lithuanian family which migrated to Australia in 1949. She came to Canada in 1967 after completing medical school at the University of New South Wales, Sydney, Australia. She received her psychiatric training at the University of British Columbia, Vancouver, graduating in 1972. While in medical school, she witnessed LSD psychotherapy in a psychiatric setting as part of her training. 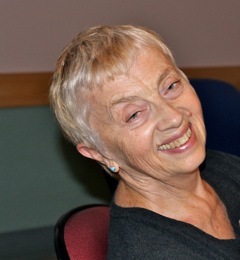 Her private practice in Vancouver became focused on psychotherapy for trauma survivors, particularly women who had been sexually abused as children. From 1987 - 1990, she trained with Dr. Stanislav and Christina Grof in Holotropic Breathwork. Over the next 14 years, she went on to pioneer the use of Holotropic Breathwork with trauma survivors, observing the special needs of people with PTSD when working in Holotropic Breathwork groups. Through this work she came to see the value of working with non-ordinary states of consciousness for people suffering from PTSD. Dr. Pacey continues to practice psychiatry in Vancouver, and she has lectured in Canada and the US.